The future of Joomla! CMS, Jomla! version 1.5, has new framework with code based for the Joomla! core completely re-written and built with PHP 5. Thus, a lot of existing extensions, plugins, templates and modules for Joomla! version 1.0.x does not work or fail to work properly in the Joomla! 1.5, sometimes not even able to upload and install the package. Users will get error messages such as “Direct Access to this location is not allowed” and “Must Enable Legacy Mode In Global Config To Complete This Task.” Joomla! developers is kind enough to provide a legacy mode in Joomla! 1.5 that supports compatibility with extensions designed and developed for older version of Joomla. 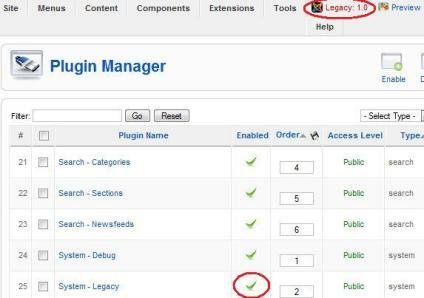 So how to enable and switch on legacy mode in Joomla! 1.5? In early beta release of Joomla! 1.5 (e.g. beta1 and beta2), option to enable and turn on the legacy mode is part of the Global Configuration. However, in the latest RC release of Joomla! (i.e Joomla! 1.5RC3) and final gold release of Joomla! 1.5, the legacy mode support has been moved to be provided by plugin. Thus to enable the legacy mode, simply follow steps in trick below to publish the Legacy Mode plug-in. Login to Joomla! 1.5 Site Administrator panel (http://www.domain.com/administrator). Mouse over Extensions in the main horizontal menu, then click on Plugin Manager. Locate plugin named System – Legacy, and then click on the check box in front of it. 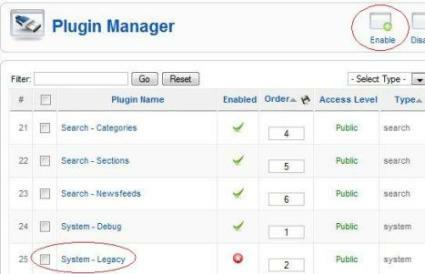 Ensure that Legacy: 1.0 status appears on the top right corner, and the Enabled column for “System – Legacy” is ticked. The Legacy Mode has been enabled. With Legacy Mode, users can now use extensions, modules, plugins and templates from Joomla! 1.0.x series in Joomla! 1.5 and ensure that the modules are working properly. Joomla! 1.5 now is compatible with Joomla! 1.0. Note that if you don’t install and populate Joomla! with sample data when installing Joomla!, the default modules and plugins are not loaded into the Site Administrator Panel. If you cannot find the Legacy Module plugin, try to build the sample data again.